A dual-rail power supply available in kit form (involves some SMD), as a pcb assembly (install in your own case) or as a stand-alone unit. 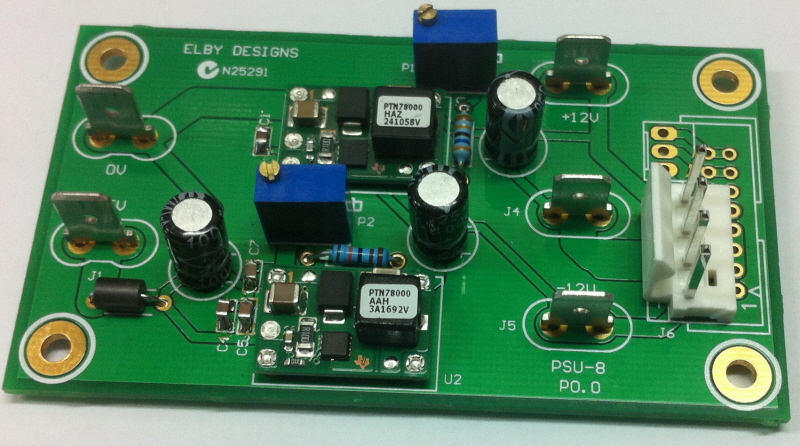 Component Kits include all components to dress the board but do NOTinclude the PCB. Input connections are via 1/4" quick-connect spades while the output is also available through 1/4" quick-connect spades or a 4-way 0.156" header. Please refer to the PSU-8 Datasheet for output ratings. The Enclosure Kit comprises a Hammond 1445C housing with a 2.5mm DC power-in connector and a 4-way MIC power-out connector. If ordered with a PSU-8 assembly then the PCB will be supplied already installed. Image shows an earlier prototype of the unit.